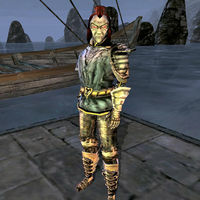 Virevar Tilvayn is a Dunmer shipmaster whose vessel, the Tasty Seahorse, can be found docked at Firewatch. He provides transport for his customers to Bal Oyra, Helnim and Tel Ouada. † Virevar will not offer travel to Helnim if Antediluvian Secrets is not installed.